Man shovels snow in Grand Ledge on January 28, 2019. Emergency declaration from January 28, 2019. 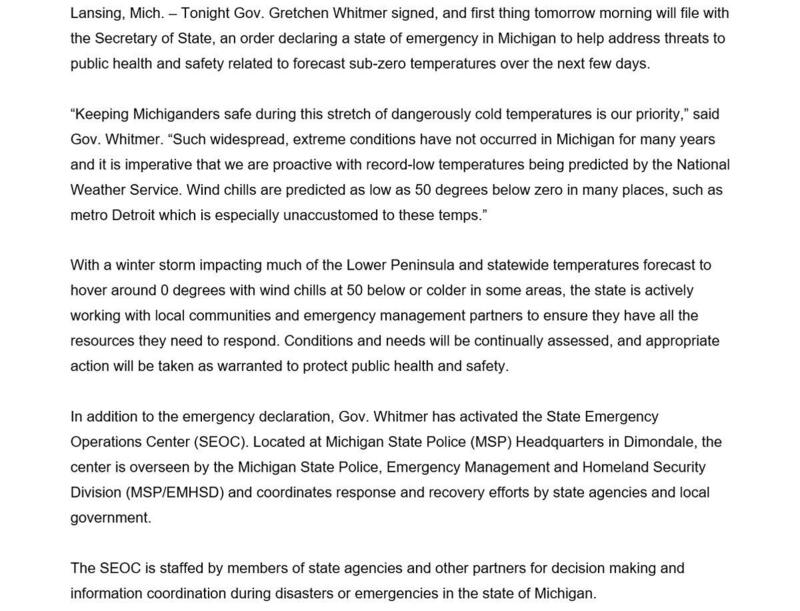 Anticipating the extreme wind chills forecasted throughout Michigan, the governor made the declaration on Monday night. 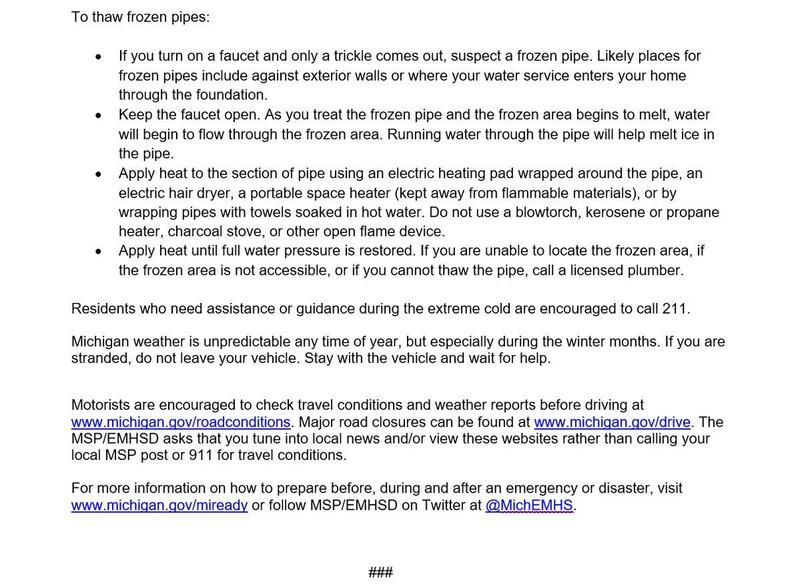 Governor Whitmer tweeted: "Keeping Michiganders safe during this stretch of dangerously cold temperatures is our priority" and attached a 3-page declaration which included advice for safety during the cold. The governor also activated the State Emergency Operations Center inside the Michigan State Police headquarters in Dimondale. The center coordinates response and recovery efforts throughout Michigan. 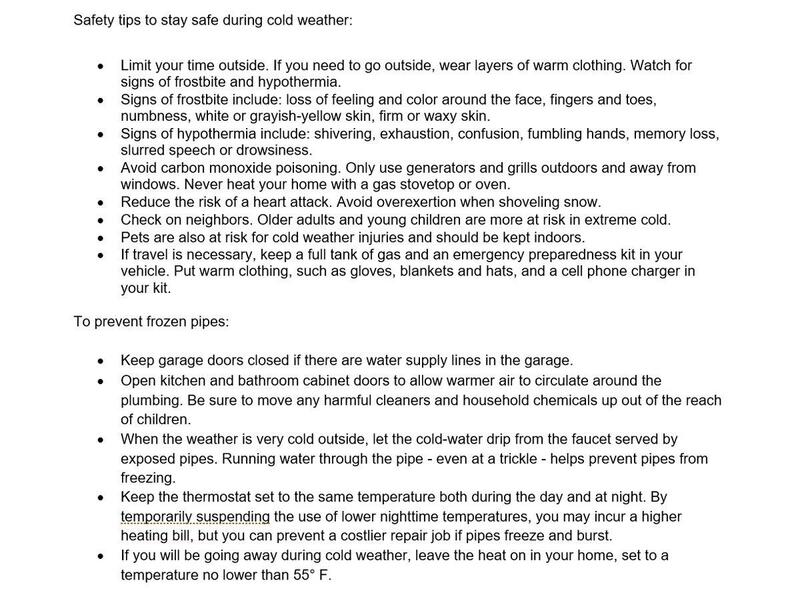 The National Weather Service has issued a Wind Chill Warning for Clare, Clinton, Gratiot, Ingham, Ionia, Isabella, Jackson, Mecosta, Montcalm and Osceola counties. Meteorologists warn wind chills could dip as low as 40 degrees below zero on Tuesday night. On Monday, nonessential government offices in Michigan were closed, including the Capitol. In the Capital region, the cities of Lansing and Jackson, as well as Meridian Township, have declared a snow emergency. Updated Tuesday at 7:49 a.m. Schools in Charlotte, East Lansing, Grand Rapids, Lansing, Waverly and more will be closed on Tuesday. Click here for the growing list. Homeless shelters in Lansing and Jackson say dozens of people sought refuge during this week of bitterly cold temperatures but they have room for more. WKAR's Reginald Hardwick reports on resources for homeless Michiganders during bitter cold. The Capital Area Humane Society in Lansing is urging people to bring animals inside during this week of below zero temperatures and wind chills. WKAR's Reginald Hardwick talks with Capital Area Humane Society about cold weather precautions for pets. Heavy snow has led to the closure of Michigan's state government, including the Capitol building and legislative offices. They're due to reopen Tuesday.